If you need to give presentations with your laptop and you are running Ubuntu Hardy, you might find that the gnome-display-properties (System>Preferences>Screen Resolution) do not work out of the box. So it is impossible to connect a beamer unless you clone. The same is true for a dual screen setup with Compiz. There is however a very easy trick to solve this. I have tested it with an Asus Eee PC 701 4G and with my Ati Radeon X600 desktop system. I am now enjoying running dual screen with all the 3d desktops enabled. The problem is that the default screen size configuration is too small, which does not allow you to place too screens next to each other. 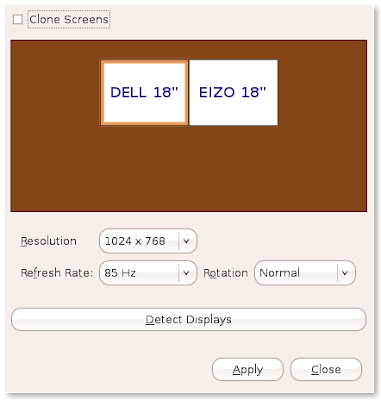 On the other hand Compiz can not handle texture sizes bigger than 2048x2048, which means for example two monitors of 1024x768. If you want to use bigger resolution, it is still possible, but you will need to turn off compiz and will loose the 3d effects. * compiz often becomes hopelessly confused after you play with xrandr, so if something seems weird, the first thing to try is Alt-F2, compiz --replace, Enter. Sometimes you have to do this blindly. Yes, you can patch libmesa, but still it would limit you to 4096x4096 which should be fine for most dual screen setups. Probably this will be included in Intrepid. i think this may be the answer to solve my problem. could i possibly take a look at your xorg.conf for your desktop with dual monitors? Hello, I notice that you use a picture with wrong ubuntu version on your blog. It's not 7.10, but 8.10. Do you by any chance know how to set up xorg.conf to handle HDMI instead of regular monitor cable? 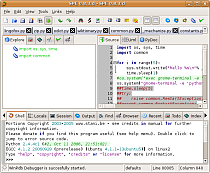 how to change xorg.conf in lucid? ?